Now that we’re home and reflecting on our trip, I realize that we have very few photos of some of the most fun or interesting things we did on our trip. Like dinner on our first night – our first experience with Mongolian hot pot. Nate – a high school friend of Shane’s – and his wife Sharon get gold stars for the week for picking us up and driving us down to San Mateo for hot pot after a long day of moving – and also for a great list of restaurant recommendations, but we’ll get to that later. Sharon gets an extra gold star for her masterful ordering of just the right delicious things for our hot pot, plus her patience in answering my questions about the random stuff in the hot pot itself. 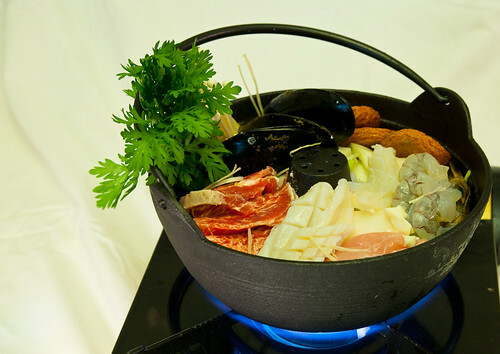 Hot pot functions sort of like fondue, except that at the end of the meal, you have an intensely flavored soup left in the pot instead of weird coagulated cheese or melted chocolate. Appetizing, right? Sorry. 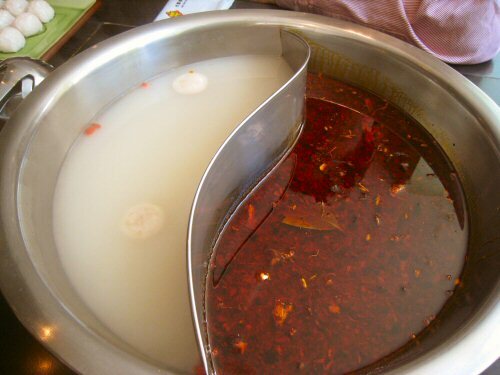 We were presented with a veritable cauldron of broth, divided into spicy and not so spicy. Along with the broth, which was placed on a flat heating surface, Sharon ordered several kinds of meat and vegetables that we would prepare by dropping it into the boiling broth. We were literally surrounded by bowls of tofu and taro, platters of thinly sliced lamb and beef, and a tray of different kinds of mushrooms, all of which would go into the soup and then into our happy mouths. Over the course of an hour, we cooked the meat, then the taro (yum! ), then the mushrooms, then finally added the greens and spooned out bowls of wonderful soup filled with all sorts of mysterious nuts and sticks and berries. In between savory bites, we snacked on some sort of delicious roll dipped in evaporated milk – probably intended to be a dessert, but just fine in the middle of the meal as well – and sipped on green tea. As Nate and Sharon mentioned, the main down-side of hot pot is that you leave smelling like, well, hot pot. That’s fine by me! I should also mention that before dinner, we found that we had an hour to kill and so wandered up Grant Street in search of Church Key, a little neighborhood bar with an excellent beer list. This is the sort of place we long for in Ann Arbor – small and friendly with an excellent selection and comfortable seats, and where it is possible to walk in at 5:30 on a weeknight and get a beer with no hassle or wait or pressure to buy dinner. Can someone please make that happen? Please? I loved it, but it’s far afield if you’re staying in SF, and probably impossible if you don’t have access to a car. 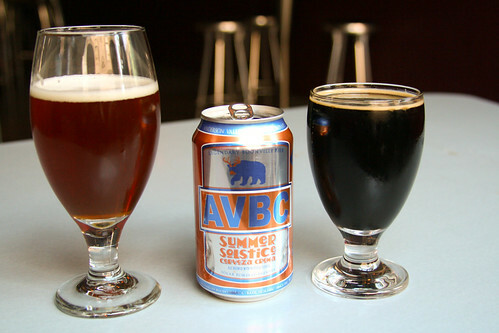 Neighborhood-y spot with an excellent beer list and a comfortable couch for people-watching. I have wanted to try this but honestly I’m afraid that even the ‘not so spicy’ will be too spicy for me. I actually really like San Mateo and have contemplated moving there.